We’d love your help. Let us know what’s wrong with this preview of Asimov's Science Fiction, December 2016 by Sheila Williams. To ask other readers questions about Asimov's Science Fiction, December 2016, please sign up. I cannot believe I wasted my time with "The Cold Side of the Island". Why is such a boring, ordinary story in a science fiction magazine? James is walking down the street late one night when he meets an old friend, Ivan. They walk together toward their apartment building, talking about the huge changes that have occurred ever since the AIs started taking over. It began with weapons falling apart in soldiers’ hands and missiles and tanks fizzling out and dying, averting a war in the Middle East. At the same time, flying bots were dropping tons of food and other necessities on refugee camps to alleviate the suffering. No one claimed ownership of these Good Samaritan cargo-bots, nor of the gremlinesque nanoes that were screwing up the mechanisms of war. It soon became known that these were machines built and run by other machines. It was becoming undeniably evident that something new was moving upon the face of the land. Indeed, that the world was being rebuilt around us, disassembled and reassembled under our feet. The AIs were taking over, and they were changing the rules. “They Have All One Breath” is strongly reminiscent of Jack Williamson’s well-known classic 1947 novelette With Folded Hands..., but takes a somewhat more ambivalent, nuanced approach to the takeover of society by robots. Karl Bunker effectively uses flashbacks to relate the details of the takeover by the AIs, with the division of opinion about the benefits of the takeover being represented by James and his former partner Lisa. Though Bunker owes a major conceptual debt to Williamson, his story is a thought-provoking and well-written one that’s worth reading. A few great stories, a stunning, wonderful one, and a couple of duds. "They have all one breath" by Karl Bunker is one of the best stories I've ever read. I read it on a flight from Chicago to LA, and loved it. Maybe it's because I've been thinking about self-driving cars a lot lately, but it gripped me right away. It is about our society in about 50 years from now, after the singularity has happened, and Super A.I. has been achieved (a scenario that is not impossible). I consider Arthur C. Clar A few great stories, a stunning, wonderful one, and a couple of duds. "They have all one breath" by Karl Bunker is one of the best stories I've ever read. I read it on a flight from Chicago to LA, and loved it. Maybe it's because I've been thinking about self-driving cars a lot lately, but it gripped me right away. It is about our society in about 50 years from now, after the singularity has happened, and Super A.I. has been achieved (a scenario that is not impossible). I consider Arthur C. Clarke to be the best SF author (and he's quite possibly my favorite author overall), and I think somehow Bunker managed to capture the sparkly magic of his stories in this work. The time and work that went into the story are visible in that he included a "wow" idea in almost every paragraph, which was a trademark of the best Clarke. Like in some of Clarke's stories, I guess one of the challenges was to include some type of conflict within a utopistic / perfect world. The solution the author found works very well, and - in my opinion - despite the negative bend, the story maintains a certain positive, utopian feel - as opposed to all the dark, sad SF that is produced today. "Empty shoes by the lake", "The cold side of the island", and "Where there is nothing, there is God" are great stories. I really enjoyed the cover novella, "Where There Is Nothing, There Is God" by David Erik Nelson, which is also by far the longest story in the issue. Nelson has written a couple of other time travel stories for Asimov's, and I've enjoyed those, too. He avoids the usual time travel tropes and finds fascinating new angles with which to approach it. In this case, some unsavory people have found a profitable use for the past, beyond the reach of modern law. This issue is wort Good news and bad news. 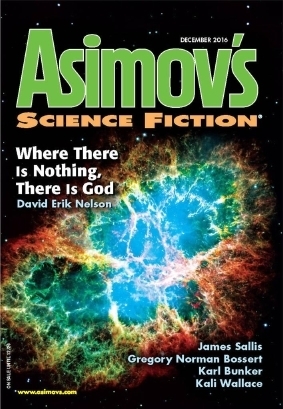 I really enjoyed the cover novella, "Where There Is Nothing, There Is God" by David Erik Nelson, which is also by far the longest story in the issue. Nelson has written a couple of other time travel stories for Asimov's, and I've enjoyed those, too. He avoids the usual time travel tropes and finds fascinating new angles with which to approach it. In this case, some unsavory people have found a profitable use for the past, beyond the reach of modern law. This issue is worth getting just for this novella, and my rating for the issue really reflects just this. The other stories, I wasn't so thrilled with. "Empty Shoes by the Lake" (which is quite short, despite being listed under novelette in the table of content), "The Cold Side of the Island", etc are the softer, touchy-feely type stories. I'm not in touch with my own feelings, even less interested in others, not at all in fictional characters'. "How the Damned Live On" is really short, little on the odd side, and in that comfortable middle ground of enjoyable but not spectacular. As some others have said, the stories by Nelson and Bunker were excellent, moving and memorable. The rest were mostly forgettable. Great features by Silverberg and Heck, as usual. The double issue that kicked off 2017 is a better example of what this magazine is capable of. How does the world react when the AIs take over? When they destroy weapons of war, provide food and housing to the poor and the needy, police violence by stopping it with an electrical tap? How can couples wanting children deal with a reduction of births? Horrible and wonderful, impossible, yet not. Makes you think about just how bad a perfect world could be. 3.5 out of 5. Told in alternating points of view, Becca and Rafi share the stories of their lives, both together and apart and together again. Not so much eerie as familiar, like a story half remembered. 3.5 out of 5. Illegal tech drops, refusgges from an increasingly hostile United States, underground parties, governments taken over by fascists and bigots. And a mysterious watcher...or two. While the tech stuff went over my head, I still loved this. There was magic and possibilities within. Hope even. 4 out of 5. One of the castaways makes friends with a giant talking spider. Strange and sad. 3.5 out of 5. Returning tie after Jesse died, Lacie brings the horned skull she and her two friends found as kids. Because they agreed to return the bones when one of them died, Lacie and Thea venture into the woods again for the last time. No explanations, no solutions, just an old mystery and people growing older. I don't know if this truly qualifies as science fiction, even with the mysterious horned skull. There isn't much to this story, just a moment out of time. 3 out of 5. (New Guys Time Portal) Struggling actor Paul is hired to go back in time to get silverware in exchange for the communion of meth. Jeez, I hated this one. Not for the quality of the writing, but for the subject matter. It couldn't be more depressing. 3 out of 5. Sarah Pinsker’s Guest Editorial That’s Far Out, So You Read it Too? muses on the connections, and the similarities, between SF and music. Robert Silverberg’s Reflections examines the possibility and desirability of resurrecting the Dodo genetically. Peter Heck’s On Books discusses novels by Lois McMaster Bujold, Charles Stross, Pierce Brown, Tim Powers, Indra Das and Lavie Tidhar. They All Have One Breath by Alexander Jablokov explicitly references E M Forster’s The Machine Stops Sarah Pinsker’s Guest Editorial That’s Far Out, So You Read it Too? muses on the connections, and the similarities, between SF and music. Robert Silverberg’s Reflections examines the possibility and desirability of resurrecting the Dodo genetically. Peter Heck’s On Books discusses novels by Lois McMaster Bujold, Charles Stross, Pierce Brown, Tim Powers, Indra Das and Lavie Tidhar. They All Have One Breath by Alexander Jablokov explicitly references E M Forster’s The Machine Stops in a tale of a world taken over by AIs, where all acts of violence have been made impossible. Empty Shoes by the Lake by Octavia Cade is the tale of two people from a backwoods town; Rafi who gets out, makes pottery and sends his first bowl (cracked) to the other, Becca, who sees visions in the puddles left by the water that seeps out of it. In HigherWorks by Gregory Norman Bossert a black refugee from a US turned to fascism to an almost equally fascistic UK has the knowledge to allow nanotechnology to connect minds together. The extremely short How the Damned Live On by James Sallis is set on an unspecified island which contains a giant speaking spider which experiences time differently from our human narrator. The island in The Cold Side of the Island by Kali Wallace is somewhere off the north east coast of the US. One day three youngsters find a set of unidentifiable bones in the woods, bones which bind then even though they’ve drifted apart. This issue is front loaded with all the best stories appearing at the start. Which is good, since they are also the longest selections in the collection. "HigherWorks" was the novelette I struggled to get through in this issue. "Where There Is Nothing, There Is God," was an interesting look at the temptations time travel offers. "The Cold Side of the Island" is a look at the ties that bind us to old friends and home. "They Have All One Breath" looks at life under AIs. In his editorial, Robert Silverberg discusses bringing back dodos. The cover story "Where the is nothing there is God" was pretty good but my favorite, hands down was They all Have One Breath by Karl Bunker. The other ones were all pretty good. "The Cold Side of The Island" and "Higherworks" were probably my least favorite. "The Cold Side of the Island" by Kali Wallace was my favorite of this month's bunch. The cover story was good, everything else was just okay at best.